Upgrade your outdoor with the power of mist. The fantastic outdoor cooling system provides a cool environment from the heat for your favorite outdoor areas. Help you beat the summer, and what's more, it will help to prevent the mosquito when cooling off. 1. Make sure when you cut the rubber tube, to cut it straight and not at an angle. 2. Put ONLY 1-2mm(<5mm) of the tube into Hot Water for about 1-2 seconds to soft it first. 4. You could try to add a water pump(DO NOT exceed 60W) to get better mist, or when your local pressure is too low. Choose the SIZE you need - Each size is under tested. 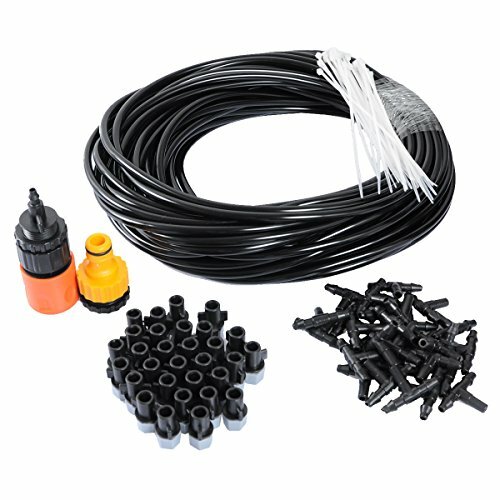 If you want to extend the kit, you could add a water pump or contact us for help. We provide 30 Days 100% Money Back Guarantee if not satisfied for any reason. Note: Water timer & Filter are not included. If you have any questions about this product by theBlueStone, contact us by completing and submitting the form below. If you are looking for a specif part number, please include it with your message.